The Thunder-Grizzlies series has been nothing short of amazing. 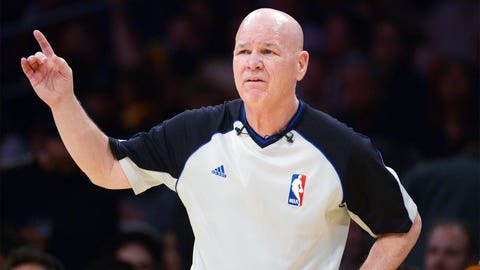 And the career of referee Joey Crawford has been nothing short of controversial. The two unstoppable forces collided Tuesday night. For the eye-popping fourth consecutive game in their first-round best-of-7, Oklahoma City and Memphis headed to overtime. With the Thunder down 100-98 and 27.5 seconds to play in the extra frame, Kevin Durant went to the line for two shots with a chance to tie. He sank the first one. Then, as he lined up for the second, Crawford suddenly sprinted toward him, whistle blowing, and took the ball from Durant’s hands. 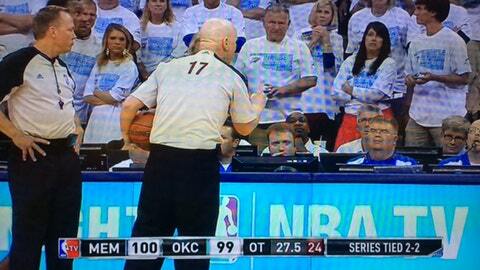 Joey Crawford stops Kevin Durant before his second free throw late in overtime. Crawford gestures to the scorer’s table. Something was apparently awry with how the foul had been recorded, as Crawford requested a scoreboard correction of the team foul totals. NBA TV sideline reporter Lewis Johnson confirmed that was the issue during the postgame broadcast. 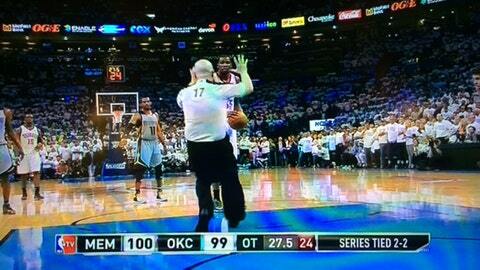 With the crowd booing and players and coaches confused, Crawford returned the ball to Durant. The Thunder star — an 87 percent free throw shooter during the regular season — then missed the potential game-tying free throw. 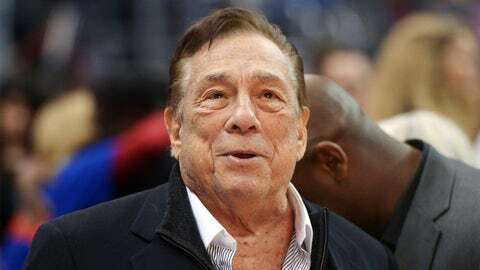 "That’s what I was afraid of," NBA TV analyst Mike Fratello said on air after the miss. "(The delay) kind of broke the momentum of Durant." Memphis killed 24 seconds off the clock on its ensuing possession, and the Thunder’s desperation attempt to win in the final seconds ended with a Serge Ibaka put-back attempt going in … but it left his hand after the horn. Fratello wondered on-air if it was all necessary. "I’m not sure in that situation, could (Crawford) not have let (Durant) shoot it, and then made the correction after the shot?" Fratello said. Memphis held on to win 100-99 and now leads the series three games to two headed back home for Game 6. In his postgame press conference, Grizzlies coach David Joerger cut short any discussion of the subject, telling a reporter he "didn’t understand" in the moment what Crawford was trying to communicate. What do you think? Did Crawford’s action make a difference?